If you have read many of my posts, you’ve maybe noticed that no matter what sort of issue I am puzzling over, I always find myself coming back to yin yang theory and balance. When I ask myself what is good or which of two things is better, I always seem to conclude that everything exists in a continuum with its opposite, and that the two are inseparable, and the healthy range of behavior or evaluation on the continuum varies very much depending on the situation. So to continue this trend, I want to talk about striving. But striving so often seems to mean discontent and happiness, doesn’t it? We focus on the thing we want, the thing we can’t do, the unattained goal, and the distance to that goal seems so big and we feel we’ll never reach it and it is a terrible feeling. The other day, Shifu was talking about contentedness. He pointed out that, as an organism, all a person really needs to exist is nutrients – food and water. So unhappiness that rises not from hunger or thirst is the product of the mind and the mind alone. He compared us to trees – never having a mind, they grow and flourish without worry, as tall as their environment will allow. One of my classmates replied with a story. He said he was in Peru once and a humble cheese-maker, who spent his days in his trade but mostly on his porch surrounded by his family, asked him, “Is it true that Americans are all very busy all the time?” My classmate agreed that was true. And the cheese-maker just started laughing as if that was the silliest thing he had ever heard. All of American wealth and prosperity and industry was a big joke to this poor Peruvian who knew he had what he needed. Shifu liked that story. I have been stumped in trying to untangle the idea of striving into its continuum and opposite, its yin and yang. But I think this is because striving is actually the name we give the intersection of two more fundamental pairings: work and rest, and agitation and calm. Striving is the name for working agitatedly. It does not have a direct opposite of its own because it exists in a complex continuum with resting calmly, resting agitatedly, and working calmly. It is hard to see the value of working or resting in an agitated way, and indeed much of my time is spent trying to free myself from habitual agitation in any mode. But remembering the model of yin and yang, I am forced to reflect that agitation too has its time and place. Because even balance has to be balanced with imbalance – perfectly balanced forces are static, and what is life if not dynamic? Just 4 months left in my time here in Wudang. We use the word graduation to refer to September 1st of this year for lack of a better word, but in some ways it is appropriate. Like every graduation I have experienced so far, these months leading up are full of all kinds of things: trying to cram every last bit of training in to get the most possible out of the time, getting ready emotionally to say goodbye to what has been my home for the last five years, trying to imagine what the future holds after graduation and be ready for it, and also tending to all the little logistical trivialities that actually seem to make up most of life. 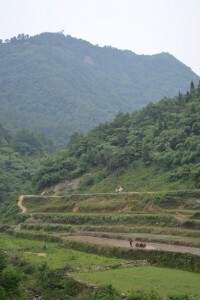 One that looms large in my mind is the task of sorting out my belongings here in Wudang. Hopefully 80% or more can just be thrown away or given away. A lot of my training clothes fall into that category, as do the collection of tools I have assembled to serve my little craft projects. My cooking supplies will be distributed to people who will stay here and appreciate them. I have a lot of home-made pickles that I have made that need to be eaten or otherwise disposed of in the next 4 months. Some of my calligraphy and art stuff needs to come home with me, as do some of my books. I also need to acquire more training clothes while I have good access to the tailors here who make our uniforms. All that stuff needs to be sorted, and the bits that will come home with me fit into bags and luggage, or boxes to be shipped home. And certainly the most tricky of things that I need to get home will be my training weapons. They are long and bulky and heavy, and some of them are not permitted on board trains here in China, which makes moving around the country with them tricky or expensive. So I think I will have to wrap them up as snugly as I can and put my faith in the Chinese postal service to get them to me back in the US. 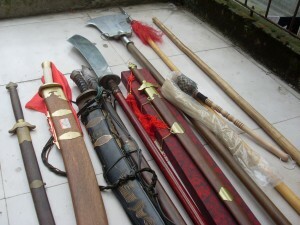 Getting these practice weapons back to the US has become sort of symbolic in my mind of the whole process of leaving China, so that I can hardly pick up a sword without weighing it in my hand to think what it will cost to ship it home, and weighing it in my heart to think what it would cost to leave it behind. But there is still much to be done with them before they go in a box, so I try not to dwell on it too much until the appropriate time arrives. 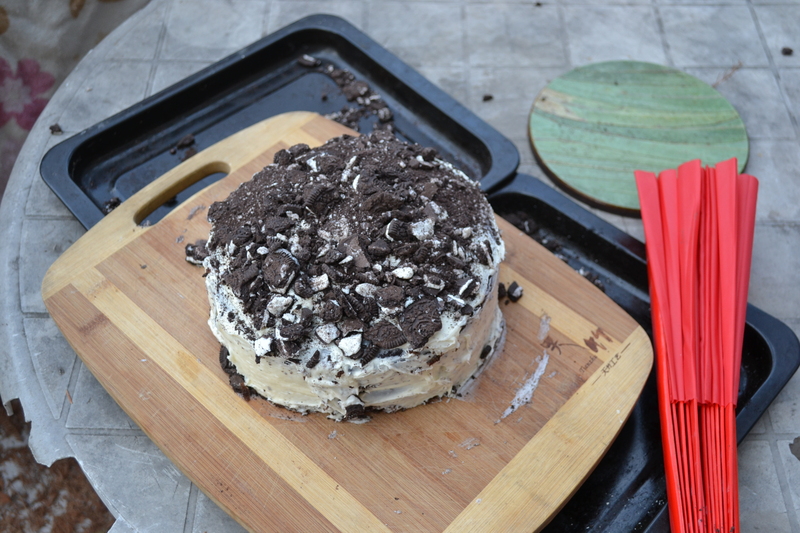 Wudang Oreo Birthday Cake. Mmmmmm. I have spent most of the last seven years missing the foods available in America, so when I got to spend some time in New York this past visit home, I was in heaven. There is more variety and quality of food experiences in New York than anywhere I have ever been. But my time in Wudang has changed my relationship with food, and I couldn’t indulge in all that wonderful cuisine without thinking a little bit. I have come to think of my relationship with food as having two parts: the nutrition side and the emotional side. As I have mentioned, training every day all day forces you to be more aware of the effects things have on your body – eat too much of the wrong thing, and you will feel the consequences the next time your coach is shouting, “FASTER! LOWER! STRONGER!” And since, “I ate too much cake,” is no excuse from training, if you don’t want to feel miserable you learn to control your diet. And once you learn that, you do get to feel the actual nutritional values of the foods you eat. I never understood how much my body needed fruit until I trained here – I knew intellectually that I needed the vitamins, but now I ravenously crave fruit, and I am aware of how bad I feel if I don’t get it. I feel like I am sensing the food with my whole body, feeling if it is good, not just tasting it. The other side of food is still important to me though: the way it makes me feel to eat it emotionally, immediately. Here I am talking about flavor, but I am also talking about memories and emotional associations, like that something that makes me crave hamburgers, and makes Chinese food taste like ash after I have been eating nothing but for 10 months at a time. When I would walk down the streets of New York on my way home from work this winter, smelling pizza and hotdogs and all sorts of tempting things, it was all I could do not to stop and spoil the nice nutritious dinner I had waiting for me at the apartment. Our senses exist to guide us to good things. Properly used, they help us find the things we need for our well-being. Thus our senses are our Five Treasures. The body needs fats and salts and sugars, so foods that have those things call to us. But they are superficial things, our senses, and if we do not master them they can be mislead and become the instruments by which we lose mastery of ourselves. Thus they are the Five Thieves. So I could define junk food as food that appeals to my Five Thieves so strongly that it brings me harm, by leading me to indulge excessively in certain desirable nutrients beyond a healthy degree, or by supplanting needed nutrients in my diet. What the streets of New York got me thinking is that there is junk food for more than just your stomach, and the Five Thieves have been made servants of all kinds of causes other than the well-being of our bodies. What is the original purpose of the senses that draw our attention to the 50 foot tall Victoria’s Secret billboard on 34th street? Why is it so hard to turn off that radio station, that TV, unplug from the internet? Not one of these things is bad. No more so that a big greasy slice of pizza. But somehow, moderation and balance must prevail. 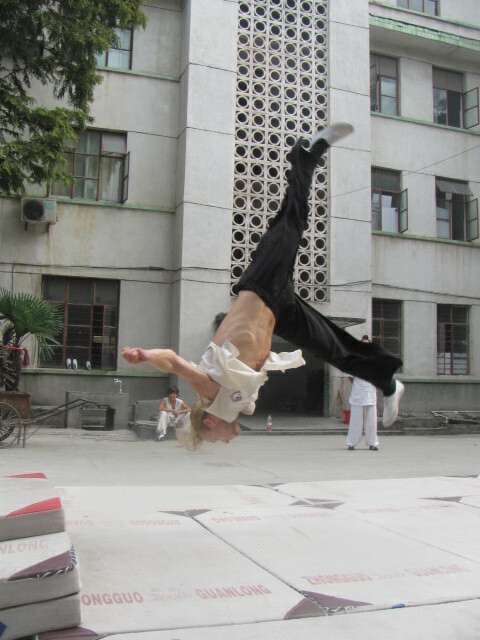 Today one of my favorite of my Chinese older kungfu brothers left to try to make his own way outside the kungfu school. Yuan Huailiang is a great young man, the kind of guy I look up to a lot, even though he is years younger than me and has seen less of the world. For one thing, he is an incredibly gifted athlete: his every movement exudes grace and strength that I envy. But more so than that, he is someone I have watched change into a really calm, confident, open person. When I first came to Wudang and met Huailiang, when he was maybe 17 or 18, he seemed like kind of an angry kid. I remember sitting down at a meal across the table from him. I was already a little in awe of him, having seen his kungfu and how he moved, but as I sat there across from him he fixed me with this stare. He later told me that he had actually practiced that look in a mirror a bit. It was the look of a predator at a watering hole, incredibly dangerous but for the moment tolerating your presence. I don’t think he wanted me to sit with him 🙂 I thought, “Wow, this is a powerful kid.” But it was also an angry, unhappy kid. Being in awe of his kungfu and raw attitude was cool, but what is better is how he soon after grew out of that angry phase and seemed to find himself. His emotions calmed down, he became much more focused in his teaching and training, and though he to this day maintains a little of the crazy that I first glimpsed at that lunch table, it is channeled through easy laughter and playfulness. Last summer we were playing hackysack. When we kicked it to him he immediately started volleying it high in the air, letting it drop through the loop of his arms, and kicking it back up time and time again with a completely spontaneous aptitude for the game. He just laughed, a pure expression of joy, as we chased him around trying to get the hackysack back. That light heart does not keep him from his responsibilities, however, and he is one of the best, most capable and thoughtful coaches our school has had. What I want to illustrate, through my little anecdotes about Huailiang, is the value of having a culture where people are expected to change. Shifu is always encouraging us to develop and grow at a very fundamental emotional level, and of course teaching us techniques to effect that change. That is what I had the pleasure of seeing Huailiang do – completely change his outlook, practically overnight. And I have seen many, many foreign students do the same thing. I really give a lot of credit to that atmosphere of expectation that grants the freedom for us to re-define ourselves. In other places and times of my life, I have felt as though I had to continue to be who I had been because that was what others expected of me. I do not feel that here — the expectation is that I will change, that I will become better and better. Last weekend I had intended to post a new blog, but it didn’t happen. Why? Sausages, that’s why. How many of you really LOVE a good hotdog? Before I came to China, hotdogs were very low on my list of favorite foods. At a cookout, I would pick a hamburger over a hotdog 7 times out of 10, perhaps. But everything changes when we are separated from the loving embrace of our mother culture. When I was home a few months ago, and had opportunity to eat whatever western food I wanted, there was no single mouthful of food that so filled me with joy as a hotdog, on a bun, with ketchup, mustard, and relish. As of September this year, I have been training intensively in Wudang for three years. Full time training is such a luxury in one sense and such a burden in another. The opportunity to devote myself entirely to getting stronger mentally, physically, and spiritually is very rare and precious. However, everyday training quickly becomes like anything else — commonplace. It is easy to forget how lucky I am to be here doing what I am doing, and think only about the things I have given up in my devotion to this lifestyle. There are times when it seems I have given three years of my life, lost time with my family, spent all my money, and put normal growing up on hold for so long, all in exchange for just one thing to which it is much harder to assign value. This past week has been a blessing in that respect. 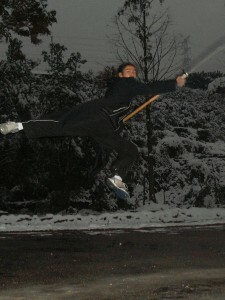 My master and many of my classmates went to Huangshan to the Fifth International Traditional Wushu Competition. 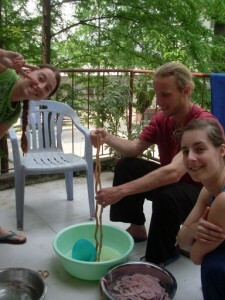 I could not afford to go, so I had a week of much lighter training here at the school. It was a wonderful break after the past month plus, which has been filled with other performances and competitions. These are stressful because if there is a value in studying traditional martial arts, gold medals and looking good on a stage are not it. But in addition to a rest, my quiet week has reminded me of the treasures training has brought me. For one thing, though the progress has been excruciating, I am indeed physically stronger than I was. And I have learned the value and the nature of hard work. For many years of my martial training, I watched those better than me with envy and despair. They made things look so easy. But three years of grinding repetition has made some things easy for me now. And I understand what it will take to reach the goals still before me; more work, sweat, grinding repetition, and above all, time. Also, for much of the three years, Master has been pushing us to take more responsibility for our health. For years this frustrated me. It seemed like common sense to me that if I was exposed to a strain of cold virus to which my body had not developed immunity, I would get sick. Nothing I could do — just science, cause, and effect. Basic microbiology. How could I take responsibility for something like that? But this week I got a cold, and I knew even before I showed any symptom that I had slipped up and with my behavior undermined my own immune system. And I realized that for a long time now I have been using sensitivity I have learned here to monitor my body and do what I needed to do to stay strong and not get sick. And it had been a long, long time since the last time I was.